PDFs are the lifeblood of many companies. For businesses that send and receive a large amount of legal documents or other forms, PDFs are much more secure and professional looking than other document types. Unlike other document editor tools, PDFs can only be edited by the creator or those with a password, and information such as how recently the document was edited (and by whom) is hidden. However, sometimes you only need to create a PDF every once in a while, not every day, so you don’t want to invest in dedicated PDF software. That’s when free PDF editors come in handy. PDFs are images of documents rather than editable text files, so to edit a PDF, one must use specific software. Most electronic signature software employ PDFs to create forms with specific editable fields for signatures, initials and other crucial information. With many of these PDF editors, you can create your own forms and include special fields for information, signatures or checkboxes. Sometimes you just need to convert a file to or from PDF format or merge multiple PDFs into a single PDF. PDF editors can easily perform these functions without all the extraneous features of more robust design software. While PDFs are generally high-quality images and preferred by graphic designers, all that supplemental functionality is not always necessary. Free PDF editors are generally lightweight and can be operated within your browser — no downloads required. Using a PDF editor, you can create legal documents, contracts, tax forms, brochures, presentations and more. While many advanced features are only included in licensed PDF software, free PDF editors contain a variety of useful tools for a casual or occasional user. 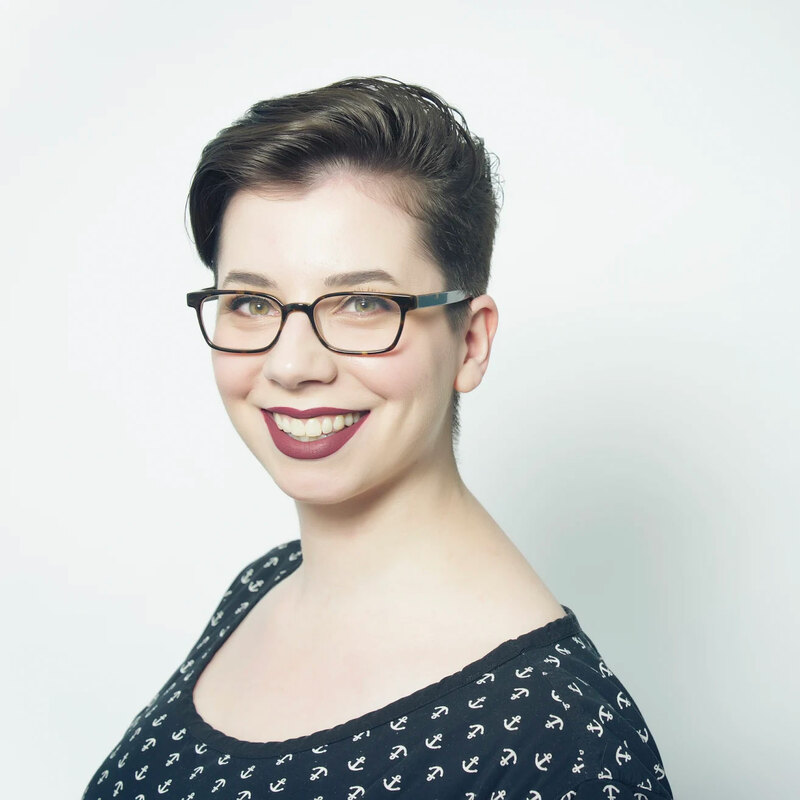 Though you (likely) won’t be able to create the next Vogue or New York Times using a free PDF editor, you might be able to design and develop an excellent zine or newsletter. The list we’ve outlined here includes any document creation solution with an available free offering. It should be noted that this does not include products that are only free on a temporary basis, such as limited trial versions for new users. They may only support one user or one project, but they’re truly free offerings. Scaling, however, will often require full investments. These products alone have well over 400 validated user reviews on G2 Crowd as of June 16, 2018, and only represent a small portion of the 70-plus document creation software offerings listed on our platform. Whenever possible, the products are ranked by user satisfaction score. Using reviews from real users, our list of free PDF editors is ordered by highest user satisfaction as of June 16, 2018 from an in-depth analyze of those reviews. PDFelement provides users with a wide variety of tools to create, edit, convert and sign PDFs. 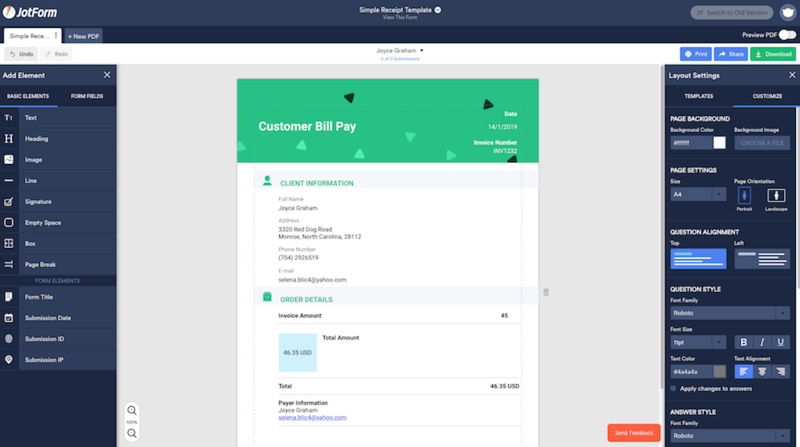 Users can create bookmarks to quickly locate points of interest, create fillable forms and export data into Excel, split or merge PDFs, convert PDFs to other file types, apply digital signatures and more. 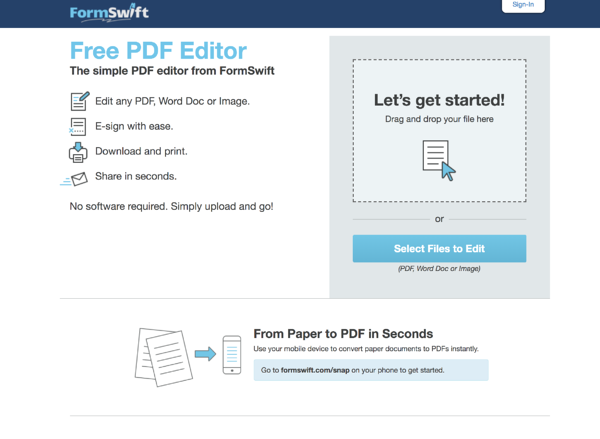 — PDFelement review by William C.
— PDFelement review by Nick L.
— PDFelement review by Kevin T.
Formswift is a free, cloud-based PDF editor that allows users to upload and edit a PDF within their browser. 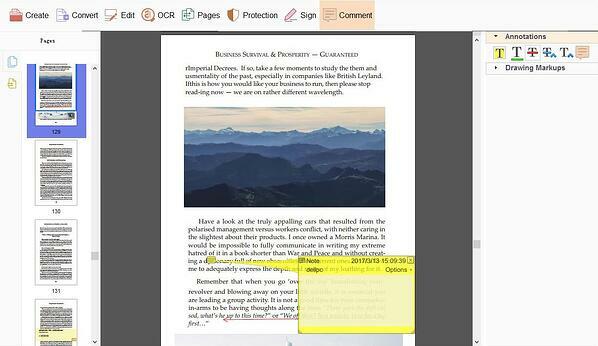 Users can add text, images, checkmarks and signatures within the editor before saving their PDF. Formswift also provides templates to easily create various business or legal documents. Smallpdf is a tool that allows users to convert files to and from PDF format, compress, split and merge PDFs, as well as edit PDFs. Users can utilize these features directly in a browser or download the browser extension or desktop version. — Smallpdf review by Bexy R.
—Smallpdf review by Xiomara Elena B. — Smallpdf review by Rosa Yuraima R.
Inkscape is a free and open-source design tool that includes drawing tools, vector graphics capabilities and text editing. Users can create a document and export it as a PDF, or import a PDF and edit it within the tool. Primarily used for image design, Inkscape is ideal for users who seek to add visual interest to their PDFs. — Inkscape review by Francesco S.
— Inkscape review by Roberto D.
— Inkscape review by Elio Q.
JotForm PDF Editor is a free PDF editing tool that allows individuals to turn collected online form response data into polished, professional-looking PDF documents. 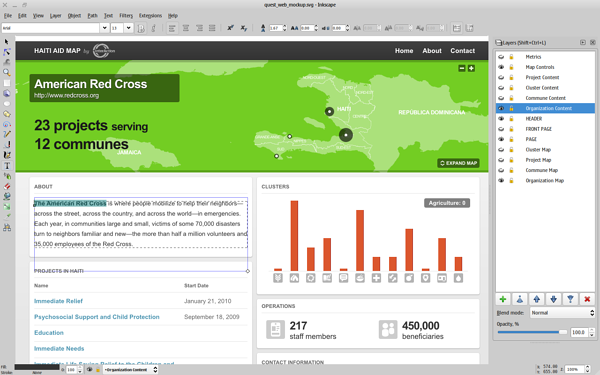 JotForm PDF Editor offers full customization as well as hundreds of templates to choose from. They also create content around PDF documents, such as this handy guide on how to edit a PDF. 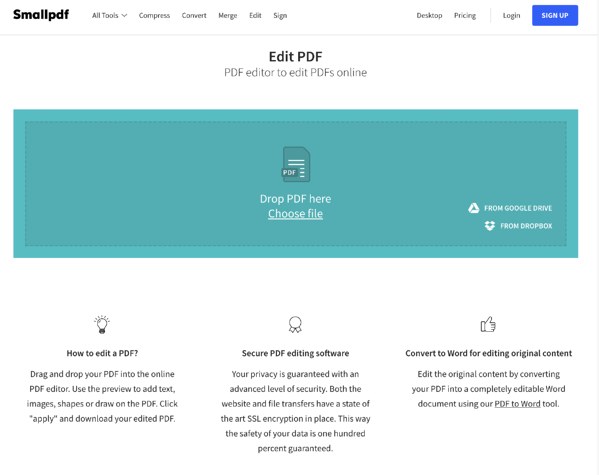 — JotForm PDF editor review by Anji D.
PDF Pro is an online PDF editor that works within a user’s browser. Users can create, print or view a PDF file as well as edit, compress, extract, merge, sign or write on a PDF file. PDF Pro also offers several file conversion options for PDFs. “This online application allows me to compress the size of my work documents to save them or send them by mail more easily. It is a tool with which I can create, edit and review any PDF file, I can add text, export, insert and modify tables and graphics and create forms necessary for the research work of my students. 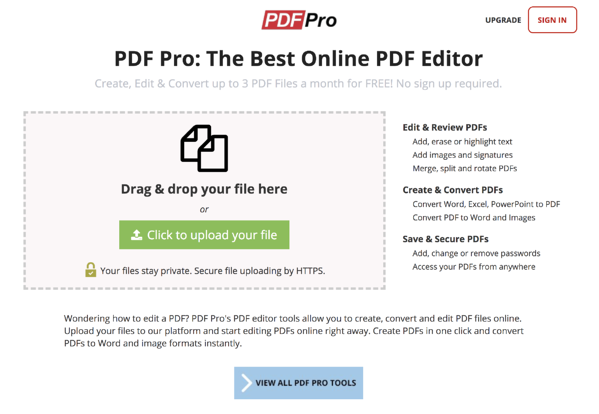 — PDF Pro review by Ana S.
— PDF Pro review by Ariel C.
PDFescape is a free online PDF editor, reader, form filler, form designer and annotator. All of these tools work in a browser, so no software needs to be downloaded. Users also can purchase a desktop version with similar functionalities. 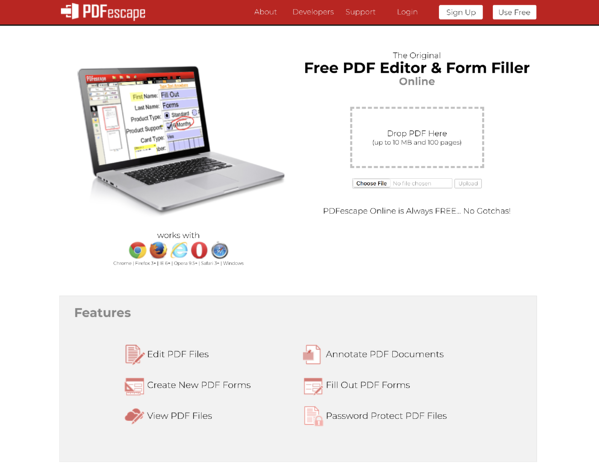 — PDFescape review by Cruzulys C.
— PDFescape review by Jose Manuel A.
Sejda is a PDF editor available as a G Suite add-on for Google Drive. 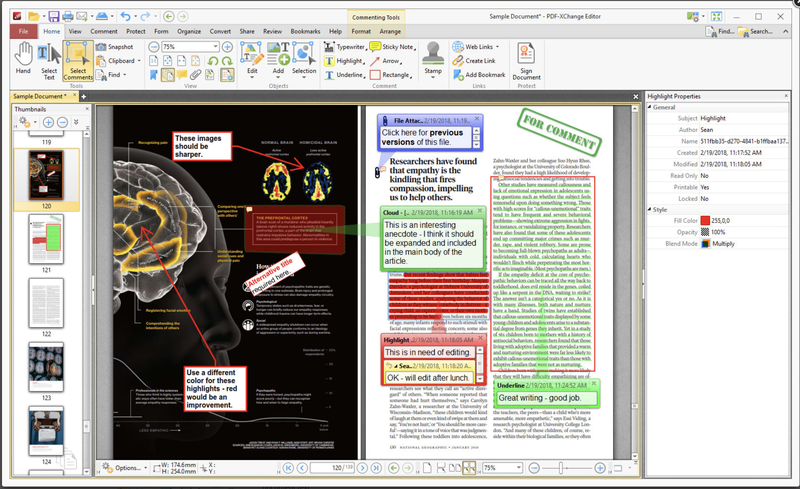 Users can edit PDF documents by adding text or images, editing existing text, including annotation and drawing shapes. There is also an electronic signature feature. Be the first to write a Sejda review! PDF-XChange Editor is a free PDF editor with viewing, editing, annotating, OCR and electronic signature features. Users can create PDF files from scanned documents, images, text files, markdown files and more. Be the first to write a PDF-XChange review! ApowerPDF has an online version and a desktop version with slightly different functionalities. The online version contains basic editing features as well as the ability to add text and images. 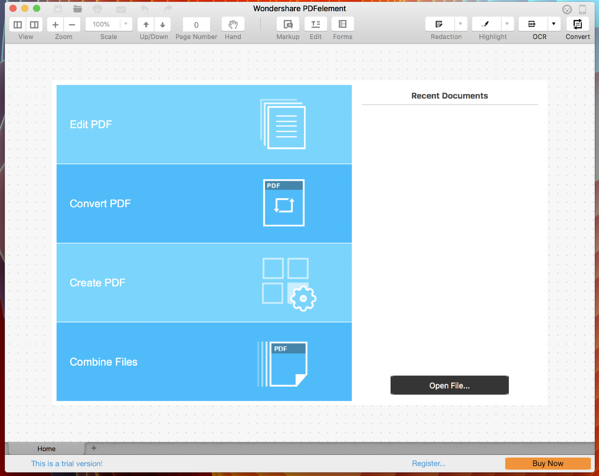 Users also can also create PDF documents from scratch. The desktop version has many more features but requires purchase to use. Be the first to write an ApowerPDF review! PDFs can go a long ways toward making you or your business look more professional. Next time you’re updating your resume or writing a memo, consider converting it to a PDF for that extra level of polish. With a free PDF editor, anyone can create professional-looking documents. Or maybe you just want to create the next big meme to rival “Is this a pigeon?” or “I don’t feel so good,” and have it look amazing (no judgment). Regardless of your intentions, free PDF editors provide a variety of tools to create and edit documents to elevate you and your business.